Each deal stage in Flexie CRM has a success percentage attached to it. 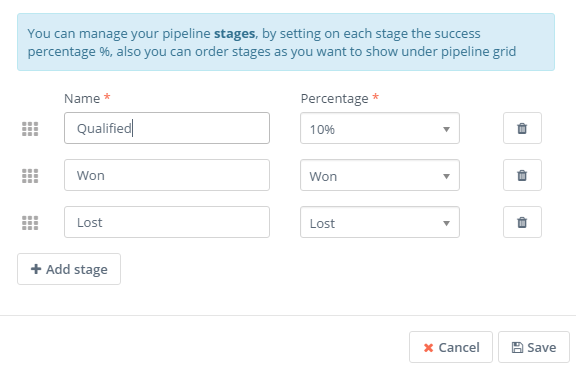 You can easily manage your pipeline stages by setting a win probability on each stage of the deal. Your company may have several products, and they each have their own sales cycle. 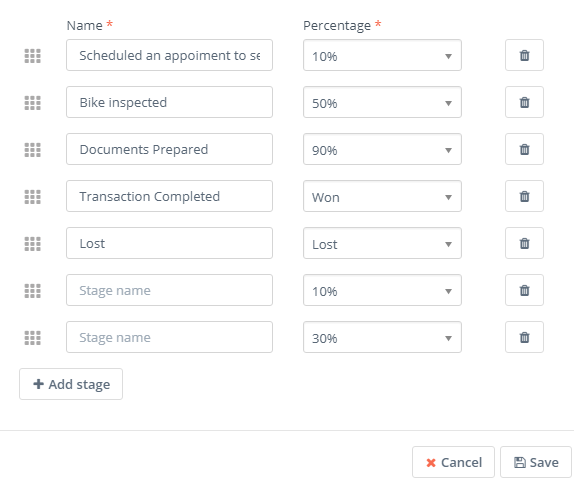 In Flexie CRM, you can set your own win probability to each stage to match the actual likelihood of a specific deal being closed. Success percentages give you an idea of expected revenues in the future. For example, a deal worth $2000, at a 60 success percentage is more valuable than the same amount at 20 %. The more your deal stages success percentages reflect the actual likelihood of them being closed, the better decisions you can make to actually close them. When it comes to accurate sales predictions, you need numbers, not simple guesswork. Flexie lets you manage your entire sales pipeline. You can set the success percentage on each stage, or the Probability (in percentage) of closing a certain deal. Furthermore, you can add new stages, modify existing ones, or assign different percentages to specific stages. Whatever your needs are, whatever the logic behind your sales process, Flexie is here to help you reach and exceed your goals.